“A history lesson over the Christmas holidays? What? !” exclaim my two sons to my husband and I. 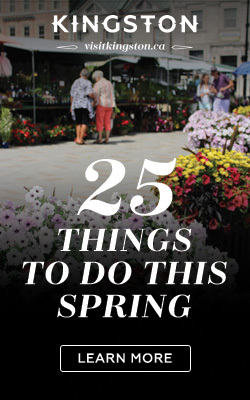 “C’mon, it’ll be fun…..I’ll take you out for dinner afterwards” I cajole them. It is a sunny Sunday afternoon mid Christmas break. I’ve been working the past few days, but the three of them have been off. And it’s time for a field trip. Armed with a printed PDF of the walking tour (written by Arthur Milnes, also a Lobby contributor! ), and an audio MP3 of Don Cherry narrating the tour (both are found on the City of Kingston’s website, you can choose from Don Cherry, Paul Martin or Jean Chretien to guide you), we meet up with a friend across the street from City Hall. City Hall is where our tour begins. “Is city hall even open today?” Shawn asks me. Oooops, I guess there is a part of the tour we are going to miss today. City Hall is not open on weekends. We fast forward through the audio and go around the back of the building to the fountain, which is now home to a majestic Christmas tree. 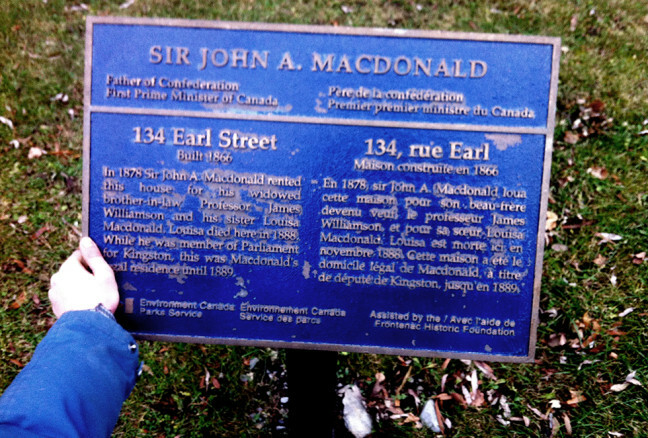 The tour then guides us west down King Street, eventually leading us to City Park where we gather at the statue of Sir John A. MacDonald, which we learn was erected in 1895. 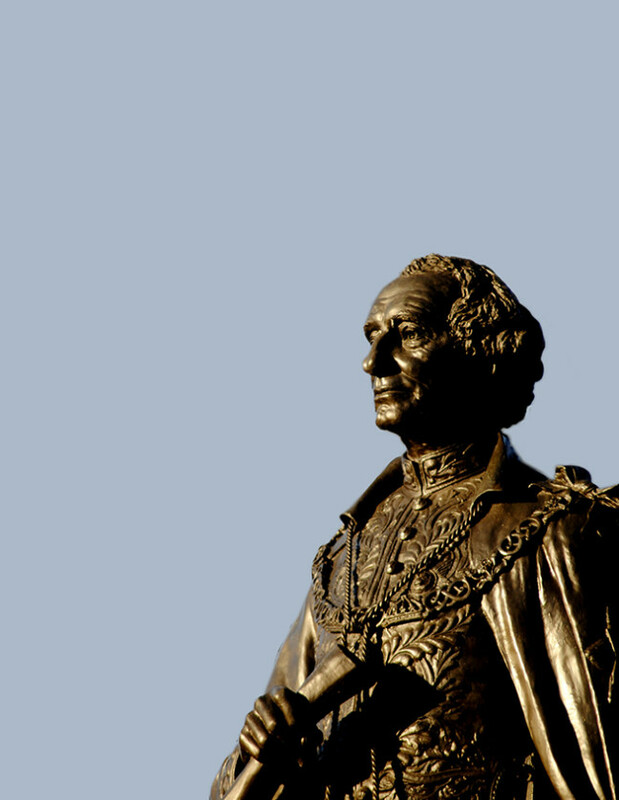 We also learn that January 11th is Sir John A. MacDonald Day, and every year, a group of Kingstonians gather at noon on this day to pay their respects, in what sounds like a fitting tribute to our First Prime Minister. I’ve marked my calendar in the hopes of attending this year. 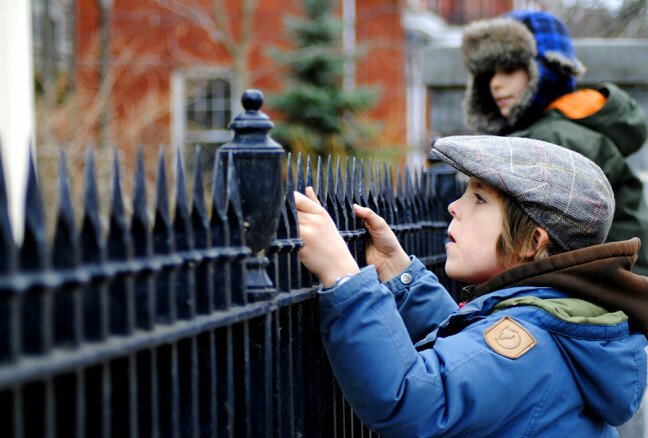 Peering over the fence at the Cartwright house, trying to read the plaque on the wall. 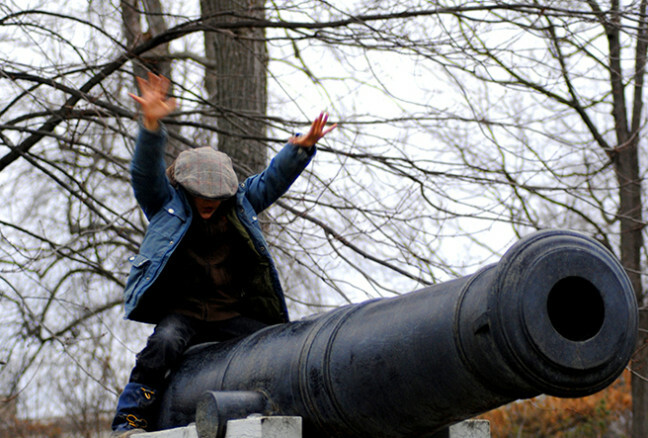 Kids cannot resist climbing the cannons that flank the statue of Sir John A. The rest of the walk takes us along West Street, past the court house and onto Sydenham Street, and then over to Johnson Street back to Market Square. 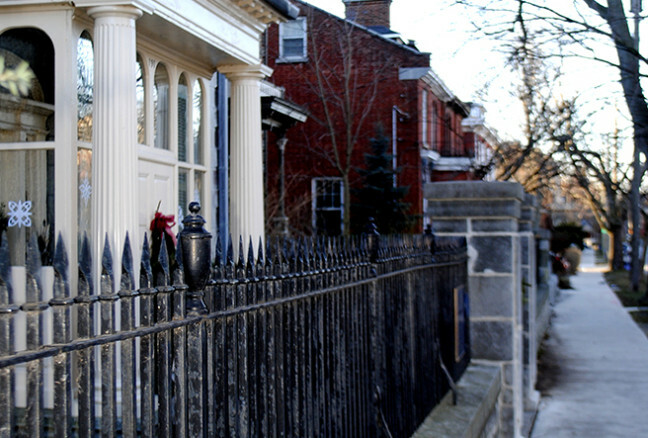 Along the way, we stop at a number of different homes, all with a plaque on them explain the historical significance of the building. 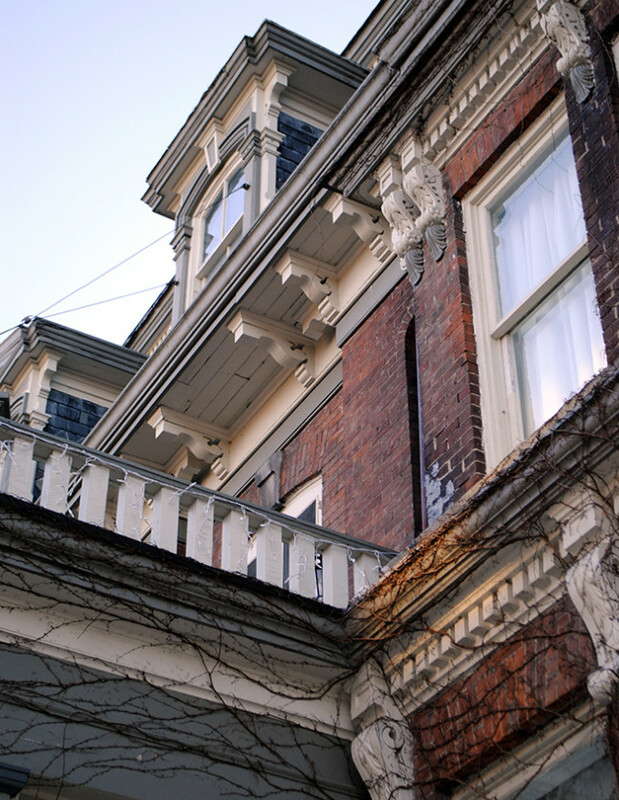 Most of them have a personal connection to Sir John A. and his family. 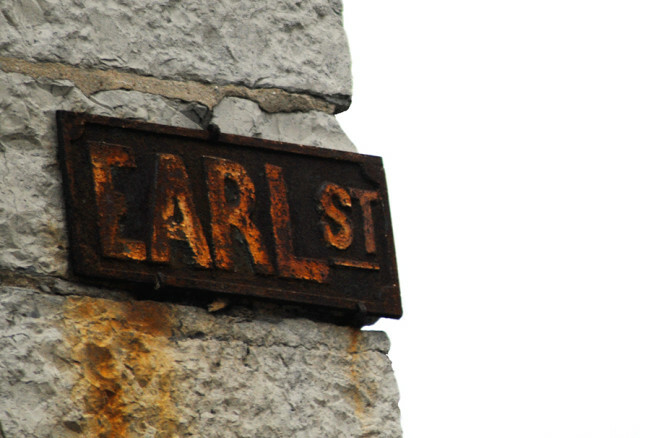 Do you know the address of this house on Earl Street? We end our walk back where we started, at Springer Market Square. We’ve been out for about an hour. We are hungry. And thirsty. 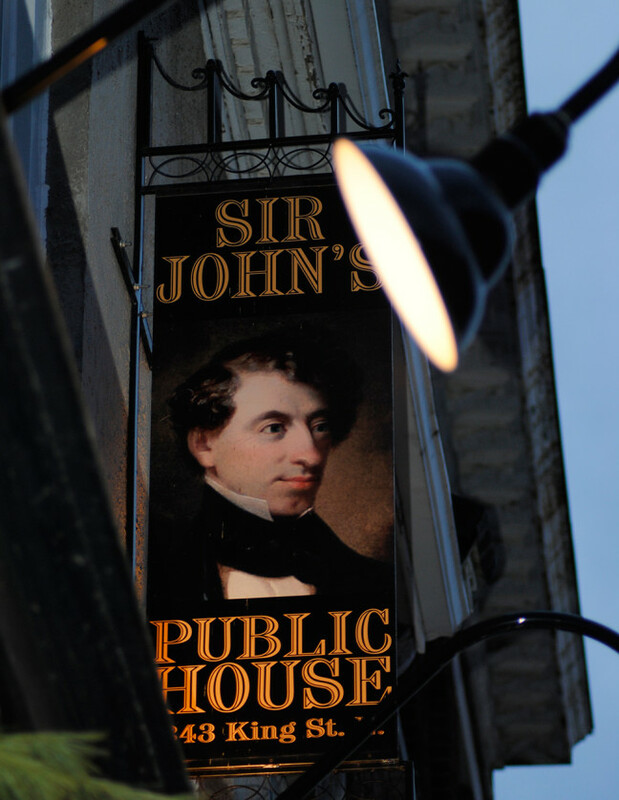 What better place to end our history lesson than a visit to Sir John’s Public House, which has its own historical significance as the building housed his office’s when Sir John A. was practicing law. Being Sunday, we enjoy $6 tankards (walking tours are thirsty work!) The boys split a yummy looking fish & chips, while the grown-ups share the Braveheart Platter, and I willingly try their haggis fritters. Which by the way, were delicious! For 5pm on a Sunday it’s a pretty happening little pub. We all decided that the walk was “pretty neat”. 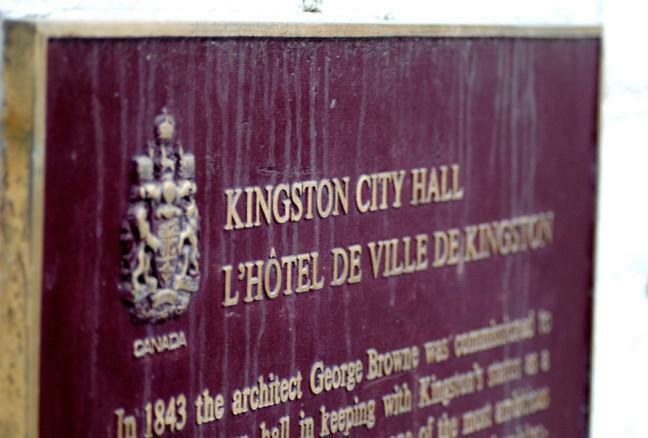 Some of the more gruesome details were what the boys took from it (they are 7 & 9 after all) If you are looking for a pre (or post) dinner walk before dining out in one of downtown Kingston’s many restaurants (I bet the number is higher than 97! 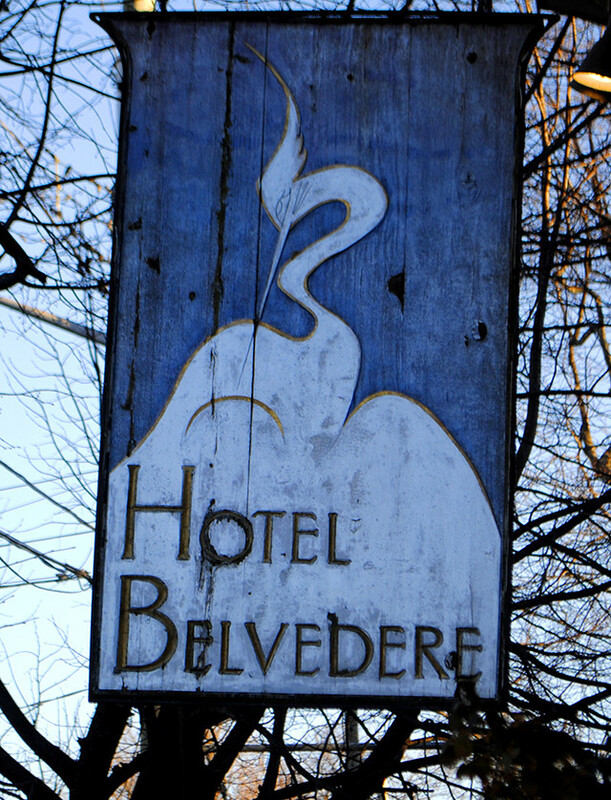 ), rather than a jaunt down Princess Street, I would recommend trying this (or one of the other found on the city’s website) walking tour. You get to see part of city through a different set of eyes. And an extra history lesson is never a bad thing!